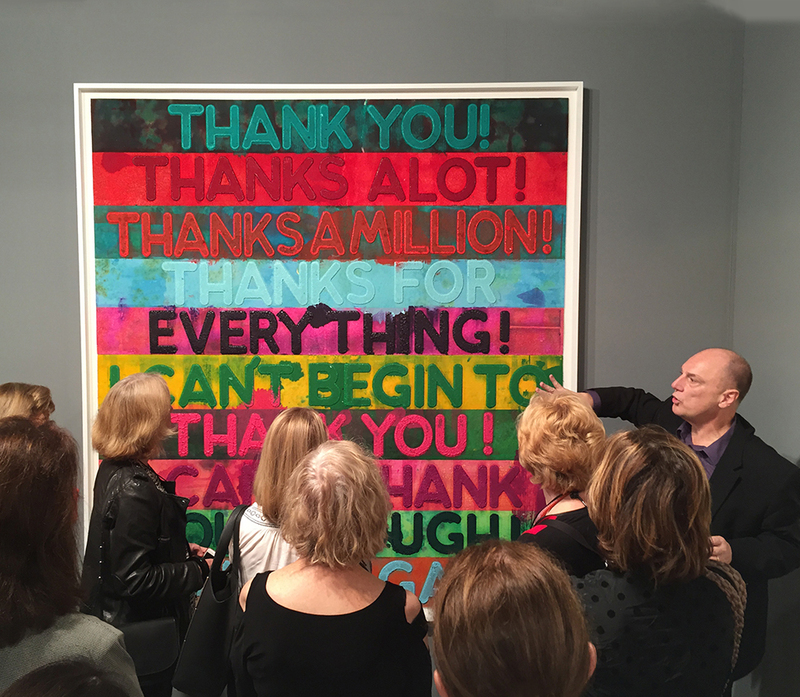 Florence Finch Abbott Director John Stomberg describes his recent visit to Art Basel Miami Beach with members of MHCAM's Friends of Art. John traveled to balmy Miami and first explored the fair on his own, making note of interesting and eye-catching artworks. He then lead the group—made up of more than 30 Mount Holyoke alumnae and Museum donors—on a two-day expedition through the hundreds of gallery booths, collections, and exhibitions that comprise this annual, art-world extravaganza, stopping along the way for illuminating discussions about his favorite discoveries. Museum director John Stomberg discusses Raymond Jonson's 1932 painting "City Forces" at Art Basel Miami Beach. Every year, thousands of artists, collectors, gallerists, and museum professionals gather in early December for a week of looking, talking, listening and yes, buying. This is Art Basel Miami Beach and it is every bit as exhilarating as it is exhausting. In five or six days, an intrepid visitor can see dozens of art fairs, private collections, and museums. It is an opportunity to discover new artists, new art, and new friends. It can also be overwhelming. When I act as a guide at various art fairs for our loyal MHCAM Friends of Art groups, my goal is always the same—to facilitate meaningful encounters with art in a context that can be chaotic and confusing. We make limited stops, we take our time looking, and we don’t worry about trying to see it all. Our visit leaves us feeling fulfilled and enriched, having had meaningful conversations about the art on view. This approach paid dividends once again this year. We saw great works by well-established artists, including a transitional work by Philip Guston, abstract but with the clear suggestion of a figure emerging from his bravura brushwork; a knock-out series of Mel Bochner’s richly inked mono-prints; a rare, mural-sized painting by Raymond Jonson from 1932 in which he celebrated the city and industry; and an important (and big) Wangechi Mutu collage from 1996 that had just been acquired by a major museum. Members of MHCAM's Friends of Art view photographs by French artist Laetitia Soulier at the Claire Oliver booth at Art Basel Miami Beach. We also discovered new artists together. Chris Doyle had a digitally animated short film on view at the Project Miami booth of the Catherine Clark Gallery. It is a reinterpretation in video of a Hudson River landscape in the context of New York City. It was stunning. We also lingered in the Claire Oliver booth studying the work of French artist Laetitia Soulier, who was enjoying her debut with the gallery at the fair. She constructs elaborate models, which become the subject of her photographs. These are eerie, complex tableaux that balance visual beauty with deep intelligence. By making stage sets for her works, she reinforces the idea that photography can construct reality. In this way, she simultaneously embraces and defangs the deceit inherent in the medium. For all the wonderment on display, there are also moments of heartbreak at the fairs: we saw a major Jean-Michel Basquiat painting hung in a hallway between two tents, exposed to dripping water, and a John De Andrea sculpture placed in an uninviting passageway. I chose not to focus on these moments of disrespect to artists and their work, but as anyone who frequents the fairs will testify, there is a dark side here—the minority who focus on art only as commerce and miss the potential beauty, intellectual content, and moving experiences that creative work can provide. We ended our time together on a high note with a private reception at the magnificent Frost Museum where director Jordana Pomeroy led our group through her museum’s current exhibitions. The tour included a show focused on Hans Hofmann and a little known mural commission he received in the early 1950s for a civic building in Peru. As a dedicated teaching museum, the Frost’s presentation of this largely untold story was both important and deeply informative. We are grateful to the Frost Museum and to our Art Museum Advisory Board member Elizabeth Rogers for arranging this lovely event. Finally, we need to express gratitude to all the artists who make their work available for these days of rich viewing experiences. I know that many artists share mixed emotions about showing at the fairs—the exposure to a wide range of viewers is unbeatable, but sometimes the conditions are less than ideal. Our group greatly appreciates having the opportunity to see the work of so many creative individuals at once. Indeed, we often get to meet artists at the fairs, and that is a double treat. So, thank you to the artists. At the Dina Mitrani Gallery booth at Art Basel Miami Beach, Museum director John Stomberg points out a work by Holly Lynton, a western Massachusetts-based photographer. The MHCAM Friends of Art group with Museum director John Stomberg and gallerist Elizabeth Dee (fifth from right) at Art Basel Miami Beach, December 2015. In the background is a painting by New York-based artist Julia Wachtel.